Highly Detailed Small Artwork in smaller scale with the script “Mustang 5.0” in Red and Chromium Bold text with Black outlines. 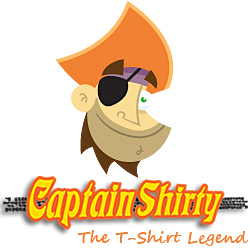 There is no image of the car on the front of the Tee. The detailed artwork is of the third generation Mustang 5.0 coupe, by Ford. This little 5.0 beauty in Ford Blue hue is reminiscent of the era of the eighties. From the highly detailed sports wheels, custom chin spoiler and grille, with front rotor and calliper high-lights, right through to the sleek hatch style rear end and the chromed exhaust tip exiting behind the rear wheel. The scale and detail is brilliant and accurate. The background art of the Tee is simple, showing the stream lined effect of the vehicles body shape, and the mirror like reflection on the ground. The Mustang and 5.0 scripts are both in “ghost” style font, with the 5.0 badge script displayed in a chromium effect style. 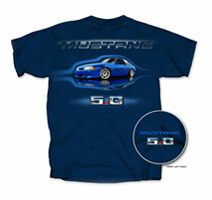 Tee shirt Colour: Available in Navy only, complete with genuine FORD official licensed product tag decal.